Mike Fonseca will find a way. 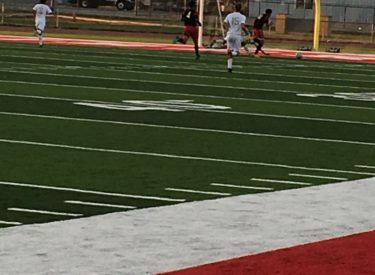 The Liberal senior scored all four goals in the Redskin 4-1 win over the visiting Hays Indians Thursday evening at the Cornselsen Sports Complex. Fonseca scored with his right foot, his left foot, his head, and added another goal for good measure. The Redskins took a 1-0 lead to the half before the Indians tied the game 1-1 with 35:15 left. Fonseca gave the Skins the lead with 17:18 remaining in the second half. David Arroyo found Fonseca for a goal with 9:18 left. Erick Ortiz assisted Fonseca with goal number four. The Redskins are 7-2 overall and 3-1 in the WAC. Hays is 3-7 and 0-5 in the WAC. Liberal plays at Garden City on Tuesday.